Earlier this month, simulation engineers and researchers presented their posters and papers at the COMSOL Conference 2017 Boston. Six papers and posters were selected to win awards, and conference attendees also voted for their favorite poster presentation. Interested in learning which papers and posters among the many great contributions were named award winners? Read on. Over 100 users of the COMSOL Multiphysics® and COMSOL Server™ products presented papers and posters in a variety of physics areas and topics. Although it was not easy to make a selection among all of the impressive submissions, the presentations featured here were given Best Paper and Best Poster awards. 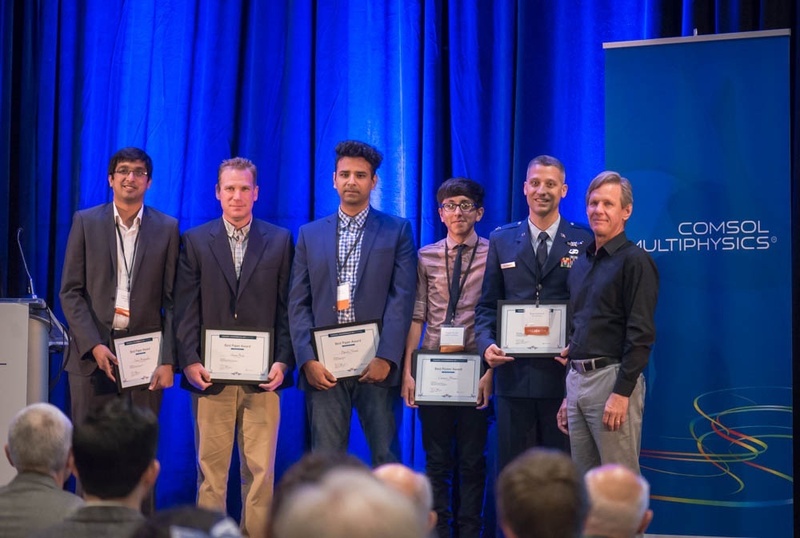 From left to right: Fahd Mohiyaddin, Oak Ridge National Laboratory; Shaun Berry, MIT Lincoln Laboratory; Dipesh Niraula, University of Toledo; Cristian Morales, Boston University; Bryan Adomanis, Air Force Institute of Technology; Svante Littmarck, CEO and president of COMSOL. Not pictured: Hwaider Lin of Northeastern University and Curtis Bradley of Benét Laboratories. This year, the program committee selected a wide range of interesting and inspiring papers for oral presentations at the conference. Three of them were selected for Best Paper awards. 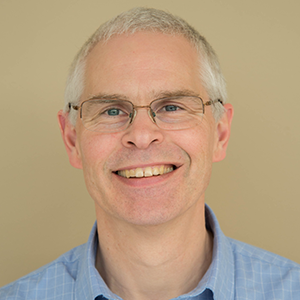 Shaun Berry of MIT Lincoln Laboratory won a Best Paper award for “Liquid microlenses with adjustable focusing and beam steering For single cell optogenetics“. Recent breakthroughs in gene technology have led to many promising treatments for a wide range of medical conditions. Optogenetics is an area where exciting new technology is being developed using light-sensitive gene-manipulated neurons to transmit nerve impulses. “Being able to photo-excite individual neurons at arbitrary sites in the brain at a single-cell level would advance the field of optogenetics tremendously,” said Berry. The microlens design provides both focusing and steering in a single optical element. Image courtesy of MIT Lincoln Laboratory. Berry and fellow researchers developed an on-chip implantable liquid microlense consisting of two immiscible fluids (water and oil) contained by tapered sidewalls of electrodes. By applying a voltage across the electrodes, the curvature of the interface between the liquids can be controlled — a phenomenon called electrowetting — to focus and steer a beam of light with single-cell resolution. “Using COMSOL [Multiphysics®], we were able to model the behavior of the liquid microlens under electrical actuation and rapidly evaluate different designs. 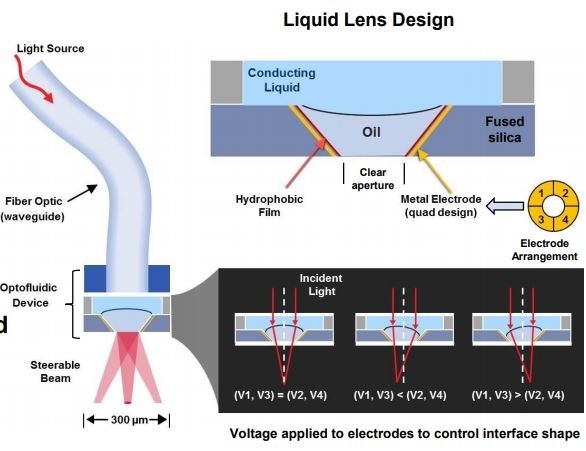 This modeling work has led to the successful demonstration of micron-sized liquid lenses that combined both focusing and beam steering,” said Berry. Dipesh Niraula from the University of Toledo was given an award for the paper “Numerical modeling of resistive switching in RRAM device“. With the increasing demand for higher-density data storage and lower power consumption, resistive random access memory (RRAM) has emerged as a competitive alternative to current silicon-based technology. The development of a resistive switching nanoscale memory device holds great promise for further downsizing electronic components. The switching mechanism between the low-resistance and high-resistance states is of particular interest in understanding the device. For the paper “Simulation of Silicon Nanodevices at Cryogenic Temperatures for Quantum Computing”, which won a Best Paper award at the COMSOL Conference 2017 Boston, researches at Oak Ridge National Laboratory (ORNL) established mathematical modeling techniques for the numerical simulation of semiconductor devices at cryogenic temperatures — a key design tool for enabling quantum computing. Electron density (n) in a semiconductor device, highlighting the single-electron-transistor (SET) island. Image courtesy of Oak Ridge National Laboratory. One major challenge ORNL addressed was ensuring convergence solving for variables such as electrical fields, currents, conduction band energies, and carrier densities. They achieved convergence down to 15 Kelvin. Curtis Bradley, together with a colleague at Benét Laboratories, won a Best Poster award for “MHD Electrolyte Flow within an Inter-electrode Gap Driven by a Sinusoidal Electric Field and Constant Magnetic Field“. Pulsed electrochemical machining (PECM) is a manufacturing process often used to produce complex micromechanical parts with excellent finishes of high-performance materials such as super alloys. The process consists of a workpiece anode and a tool cathode between which an electrical field drives material transport of ions shaping the tool. For higher throughput, a magnetic field is applied to increase electrolyte flow, and pulsed electrical current is applied to increase surface quality. However, while the magnetic field assists electrolyte flow, it also creates a complex magnetohydrodynamic flow that strongly influences the process performance. To better understand the underlying effects and optimize process parameters, Bradley studied the process through simulation in COMSOL Multiphysics® and electrical impedance spectroscopy (EIS) experiments. Animation of the simulation results showing vectors for the magnetic field (red), electric field (yellow), Lorentz force (black), and resulting electrolyte flow with arrows (blue). The flow velocity magnitude is visualized with surface and streamline plots. The animation compares high- and low-frequency simulations, where at high frequencies, the flow does not reverse direction and at low frequencies, the flow direction completely reverses. Animation courtesy of Benét Laboratories. “The complex magnetohydrodynamic (MHD) flow, when a sinusoidal voltage is combined with a constant magnetic field, required a multiphysics approach to help find optimal conditions for machining. We were able to incorporate electrochemical impedance spectroscopy (EIS) experimental results into the MHD simulation to help us find more optimal ECM conditions,” said Bradley. Hwaider Lin and his fellow researchers at Northeastern University were given an award for the poster “RF NEMS Magnetoelectric Sensor Simulation And Demonstration“, which shows how they simulated, fabricated, and tested RF NEMS sensors. Nanoelectromechanical systems (NEMS) have unique features that make them suitable for a range of sensor applications such as IoT, wearables, bioimplants, and smartphones. Among their benefits are nanoscale size, low mass, and very high sensitivity compared with other RF sensor/antenna technologies. Lin and his team work on RF NEMS sensors that combine magnetostrictive and piezoelectric thin-film materials for their function. “The RF NEMS sensor is based on our research on nanomechanical magnetoelectric antennas that can be made 1–2 orders of magnitude smaller than state-of-the-art antennas and enable further miniaturization with many potential applications for portable communications systems,” said Lin. Cristian Morales and a group of researchers from Boston University presented a poster titled “Increasing Dust Removal Efficiency of Electrodynamic Screens Using Frequency Optimization via COMSOL Multiphysics®” at the COMSOL Conference 2017 Boston and brought home a Best Poster award. For maximum exposure to the sun’s rays, solar power plants are often located in deserts. A drawback to this location is that they also have to withstand dust storms that leave behind dust-covered panels that are less efficient in producing energy. Removing dust from the panel surfaces can be very expensive and energy intensive. Morales and the research team found a solution to this problem. They designed an electrodynamic screen that is mounted on a solar panel surface. The screen consists of a pattern of interdigitated electrodes that charge the dust particles and remove them from the screen. The simulation results show that all of the dust is gone within a second of operation. Next steps include validating the simulation with experimental data. Perhaps the most prestigious award presented at the COMSOL Conference is the Best Poster award chosen by conference attendees. The posters are displayed throughout the conference for attendees to vote for their favorites. At the awards ceremony on the final day of the COMSOL Conference 2017 Boston, Bryan Adomanis of the Air Force Institute of Technology received the Best Poster by Popular Vote award for “COMSOL Multiphysics® Implementation of a Genetic Algorithm Routine for Metasurface Optimization“. The research focuses on the simulation of 3D plasmonic structures for designing a metasurface lens. Adomanis’ simulation results show that his design has transmittances twice as large as the fundamental limitations of previous 2D planar metasurfaces. 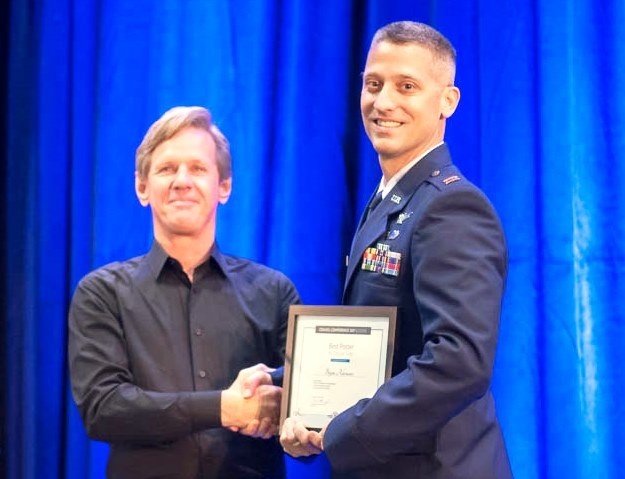 Bryan Adomanis (right) from the Air Force Institute of Technology was all smiles when receiving the Best Poster by Popular Vote award from Svante Littmarck. If you are ready to show off your own work, we believe you will appreciate the welcoming atmosphere of the COMSOL Conference and perhaps even win an award! The call for presentations for the COMSOL Conference 2018 Boston on October 3–5, 2018, will open soon. Receive updates about the conference by signing up for save-the-date reminders.